The Japan Foundation, New York is co-presenting two Panels with New York Comic Con, VIZ Media, FUNimation and Japan Society at New York Comic Con this year and welcomes Yusei Matsui to New York. 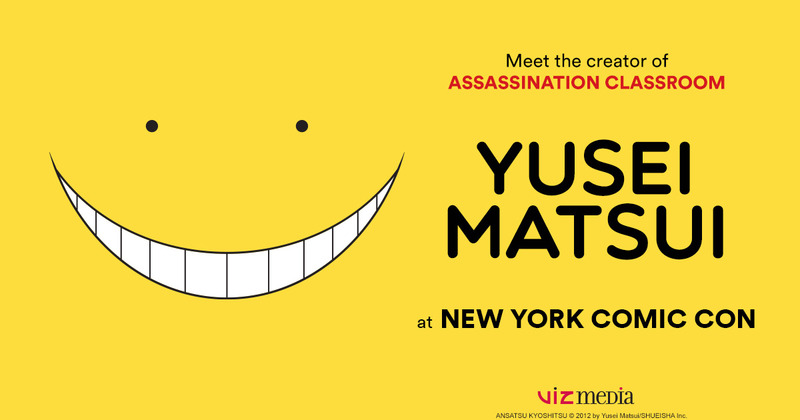 Yusei Matsui, creator of the beloved Assassination Classroom manga, in making his first North American appearance at NYCC, and will discuss his career and creative process behind his career and creative process behind his global hit! For more information please click here. Hang out with the English language editors of the world’s most popular manga! We’ve got exciting news about the LATEST developments in new series, all-time fan favorites and what we’re doing to bring you the world’s best manga! Yusei Matsui, creator of the global sensation Assassination Classroom, will be making a special appearance. For more information please click here. NOTE: Tickets to New York Comic Con are required. Tickets to New York Comic Con are sold out.